After researching the web for ideas on how I wanted my bench to look, I found this site: https://www.robomargo.com/bench.html which has many photos of bed frames turned into benches. Begin with the headboard and footboard, and set the side rails aside for now. I pre-measured another bench and determined that I preferred a 18″ seat height. Luckily the footboard worked perfectly in my plans. But, I needed to trim 3″ off the bottom of my headboard legs. Then determine the depth of your bench. I wanted mine to be 18″. (This is a little deeper than a chair (15 – 16″), but it allowed for pillows behind our backs and a more substantial size. Your footboard needs to be cut in half so it can become your arm rests. You might have to trim more from the center as I did to achieve your desired bed depth. Now you will need to build a frame of 2″ x 4″ boards for stability. This frame needs to be able to fit between the front skirt piece (side rail cut to size) and the back of your bench (the headboard). This is a picture of my bench tipped over so you can see the base support structure built of 2 x 4’s (in red). Now you have all the components to construct your bench frame. 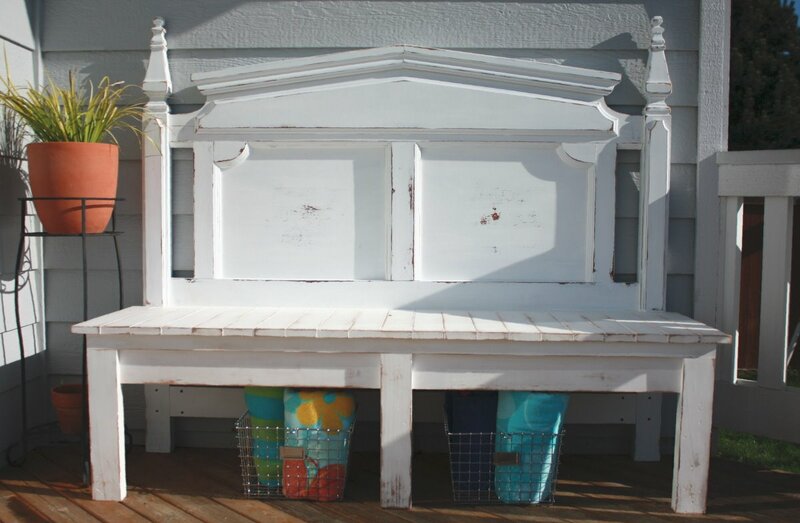 Attach the arm rest to the back of your bench (used to be the headboard) by pre-drilling holes through the bedposts and then screwing in 3″ long wood screws through the post and into the arm rest. Be sure that the arm rests are securely attached. Here is a picture showing the screws from the back of my bench. and how the arm rest looks when attached. Next you will attach your 2″ x 4″ frame to the back and sides of your bench. You can use screws, nails, and/or L-brackets to attach it. Then, you can attach the front skirt piece (cut down side rail of bed) to the 2″ x 4″ support base using small nails or brads. You are almost done with the construction! Time to cut some wood for the seat of your bench. I used two 1″ x 10″ boards cut down to size. Then cut out notches to fit around the corners of the bed posts. Then use small nails or brads to nail your seat to the bench 2″ x 4″ frame. After assembling my bench, I added wood putty to fill my nail holes and then caulked all the seams to keep water out of them. Unfortunately, I neglected to coat my bench with polyurethane, so you will notice that the paint has chipped in places. After a few rain storms, I realized that my bed frame was made from several layers of wood that was glued together. So, you will also see some gaps in the wood. After some time, I repaired and re-painted the bench. To prevent further splitting, my bench spends its days on our screen porch. But, in the meantime, won’t you come join me for some cool lemonade in the shade? Did you spot the blooming hostas and hellebores? Oh, you were too busy staring at this lavender beauty? …and sip some nice cold lemonade with me? I hope you enjoyed this tutorial. Feel free to comment, especially if you have any questions.